Who is this Old Woman? The Cailleach Beara is ever-renewing and passes through many lifetimes going from old age to youth in a cyclic fashion. She is reputed to have had at least fifty foster children during her ‘lives’. She usually appears as an old woman who asks a hero to sleep with her, if the hero agrees to sleep with the old hag she then transforms into a beautiful woman. She is considered to be the daughter of Grainne, or the Winter Sun. She is affectionately known as ‘Grandmother of the Clanns’ and ‘the Ancestress of the Caledonii Tribe’. The legends of the Caledonii tribe speak of the “Bringer of the Ice Mountains”, the great blue Old Woman of the highlands. Called Cailleach, Cailleach Bheur, Scotia, Carline or Mag-Moullach by the people, She was the Beloved Mountain Giantess who protected the early tribe from harm and nurtured them in Her sacred mountains. 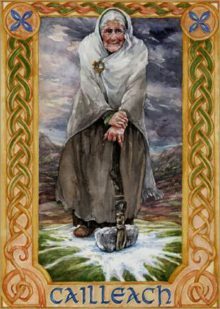 The Cailleach Beara is usually associated with Munster in particular Kerry and Cork. Her grandchildren and great-grandchildren formed the tribes of Kerry and it’s surroundings. And she is considered a goddess of sovereignty giving the kings the right to rule their lands. She herds deer. She fights Spring. Her staff freezes the ground. She is sometimes depicted as an old hag with the teeth of a wild bear and boar’s tusks or else is depicted as a one-eyed giantess who leaps from peak to peak, wielding Her magical white rod and blasting the vegetation with frost. Cailleach’s white rod, or slachdan, made of birch, bramble, willow or broom, is a Druidic rod which gives Her power over the weather and the elements. Cailleach is also a goddess who governs dreams and inner realities. She is the goddess of the sacred hill, the Sidhe, and the place where we enter into the hidden realm of the Fey and spirit beings. Sacred stones, the bones of the earth, are Her special haunts. 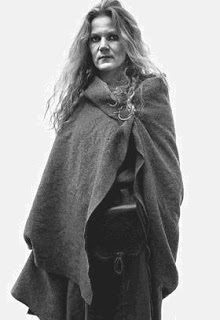 Cailleach is connected to the ‘bean sidhe’ or banshee (which means ‘supernatural woman’) who are the wild women of the Fey. In Scotland, the Cailleachan (‘old women’) were also known as The Storm Hags, and seen as personifications of the elemental powers of nature, especially in a destructive aspect. They were said to be particularly active in raising the windstorms of spring, during the period known as A’ Chailleach. Là Fhèill Brìghde is the day the Cailleach gathers her firewood for the rest of the winter. Legend has it that if she intends to make the winter last a good while longer, she will make sure the weather on February 1 is bright and sunny, so she can gather plenty of firewood to keep herself warm in the coming months. 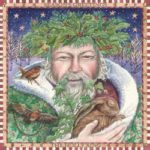 As a result, people are generally relieved if February 1 is a day of foul weather, as it means the Cailleach is asleep, will soon run out of firewood, and therefore winter is almost over. On the west coast of Scotland, the Cailleach ushers in winter by washing her great plaid (tartan) in the Whirlpool of Coire Bhreacain (cauldron of the plaid). . This process is said to take three days, during which the roar of the coming tempest is heard as far away as twenty miles inland. When she is finished, her plaid is pure white and snow covers the land. Cailleach is also the guardian spirit of a number of animals. She is associated with the ancient tradition of herding reindeer. This means that the reindeer (and all deer) are Her cattle; She herds and milks them and often gives them protection from hunters. Swine, wild goats, wild cattle, and wolves are also Her creatures. Cailleach is also a fishing goddess, as well as the guardian of wells and streams.